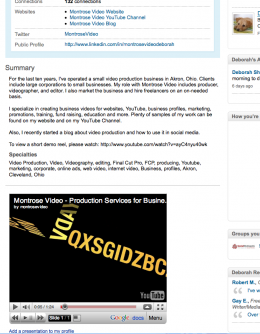 Did you know you can easily add video to your LinkedIn Profile? You get one chance to make a first impression. Here’s one of the easiest ways you can dazzle your visitor in an entertaining informative effective way. Great for portfolios, introductory videos, event announcements and more. This is what it looks like when posted. It’s tucked in neatly under your Summary. 1. Go to your Profile (Edit Profile). 4. You will be asked to sign in (enter Gmail username / password). 1. Go to your LinkedIn Google Presentation page and click “create your presentation”. A new page will open. 2. Select from the top menu bar “Insert” and choose “Video”. 3. Search YouTube videos to find yours. Select and OK. Your video will be inserted (once placed, increase the size by dragging the corners to fill the rectangle). 1. Click Link on the Toolbar. 2. Key in the website address. 3. Move link to a good location on the page (tweak later before publishing, if you wish). 4. Click on the link to test it. 1. At the top right, click on Share, and Publish / Embed in the drop down menu. 2. You will get a chance to preview and establish settings on the next page. 3. Choose small for LinkedIn. 4. At top left, name Presentation. 1. Go back to the LinkedIn App page (Google Presentation tab on your browser windows). 2. Refresh this page. Your video name will now appear at right. You may notice there are two “play” buttons. It is the lower button that should be pressed. We hope a simpler way to embed YouTube videos will be implemented by LinkedIn. Until that time, this is a good option.